I love getting out in the field in bad weather. Bad weather produces some of the most stunning conditions for photography in Rocky Mountain National Park. Sure, working in bad weather does not always produce beautiful condtions but my chances increase dramatically. During winter storms in Rocky Mountain National Park, Inversions or low lying cloud layers often form. The trick is trying to get high enough above the inversion layer to possibly set yourself up for a dramatic and colorful sunrise. This particular February morning in Rocky Mountain National Park it was snowing heavy when I drove through the Beaver Meadows enterance. I decided I would head up Trail Ridge Road to Many Parks Curve to survey the skies and see if there was any chance for a sunrise. Driving up Trail Ridge Road in the snow, my expectations were low as the snow fell. I arrived at the closed gate at Many Parks Curve along Trail Ridge Road. I could go no farther in my vehicle. I got out to survey the skies as I often do and to my surprise I could see stars overhead through the broken cloud layer. Many Parks was not high enough to be above the inversion layer but I was close. I strapped on my snowshoes and started hiking up a now closed Trail Ridge Road to gain more elevation and hopefully get above the cloud layer. 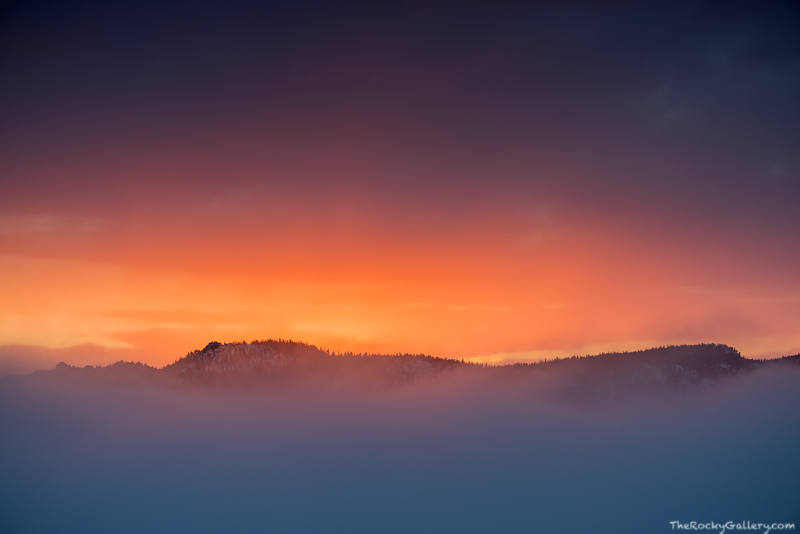 I was finally able to get above the cloud layer just as the sun began to rise behind Deer Mountain. Only the summit of Deer Mountain to the east was visible above the clouds but the sunrise and effort was well worth the reward. Photo © copyright by Thomas Mangan.